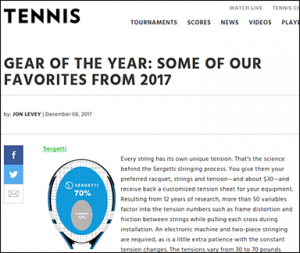 TENNIS.com was awarded the “Best Publishing Site” in the Ektron All-Star awards. TENNIS.com is a part of The Tennis Media Company – including also Tennis Magazine and Baseline. From instruction to pro-game coverage and everything in between, The Tennis Media Company – is the premier provider of tennis content. Tapping deep into an affluent and passionate market of 30 million tennis enthusiasts, including more than 5 million extremely active players, they deliver an unparalleled audience of achievers and influencers. Tennis.com is the #1 global destination for fans and enthusiasts looking to stay on top of the game, providing 24-hour match coverage in addition to breaking news, live scores and in-depth commentary from the game’s most recognized and respected writers. Racquet reviews, instructional video and features on world-class travel destinations round out the ultimate tennis portal for the largest online community of fans and enthusiasts.